With five duets involving partners related in life by blood, marriage or friendship, Dance Lovers, presented two weekends ago at the Joe Goode Annex, provided an in depth -and local- elaboration on the idea. Curated by Bay Area choreographer and performer James Graham, the program included duets by Melissa and Elizabeth Castaneda, Chris Black and Courtney Moreno, Caroline Alexander and Andrew Ward and a piece choreographed by Ashley Salter for dancers Mary-Kate O’Sullivan and Katie Florez. The dance contained thoughtful self-referential moments, where the performers disclosed possible ways of making. At one point, Grubb sits down on a chair and begins telling Graham, and the audience, that he wants to make a piece with him. He goes through several scenarios of possible duets, one that includes “being completely honest.” The sentence “I want to make a piece with you” becomes a mad refrain, repeated over and over, as the rhythm of the movement accelerates, and Graham simultaneously performs a solo in a circle. Grubb eventually comes into contact with him and the interaction becomes increasingly forceful, to the point where Grubb pins Graham to the floor, smothering his body. It is as if the desire for collaboration -and/or for the other- eventually becomes so overwhelming that it literally crushes the object of desire, a not uncommon scenario in relationships, whether personal or professional. In another self-referential moment, Graham acts out choreographic directions. In one of the tasks he gives to Grubb, he asks him to “touch [his] face like it’s not a face” and one sees Grubb’s hand kneading, rubbing, poking, and pulling Graham’s face, turning the body into a malleable material to be sculpted and processed. The moment echoes another scene where Graham stands facing the audience and performs a bio-historical tour of his body, pointing out the origins of his scars and alterations -the back of his ears pulled back when he was a child as a parental precaution for him not to be teased, a back injury during a rehearsal… At the same time Grubb touches those places that hold memory; the body reads as a time capsule holding both the personal and the public seamlessly. In a stunning moment, Grub and Graham’s bodies become parts of a kinetic construction game. Grubb’s cheek is on the floor. Graham brings his head on top of Grubb’s. Grubb removes himself and stacks his head on top of Graham’s. 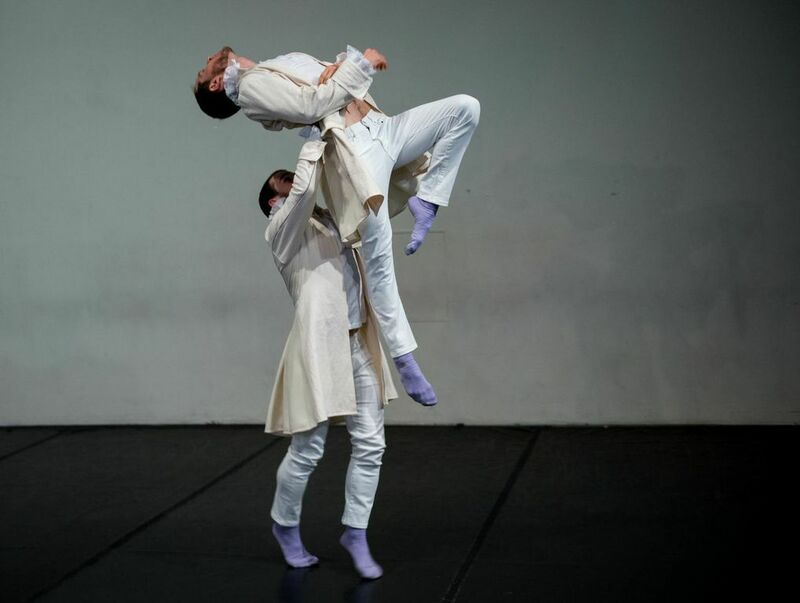 The process continues, as the two performers carefully build a tower of fleeting imprints and newly found structures, a hint at the construction process of collaboration and the ephemerality of movement. At the end, Graham stands tall, and Grubb, smaller but resourceful, jumps on Graham’s back and places his head on top of Graham, like two children at play. 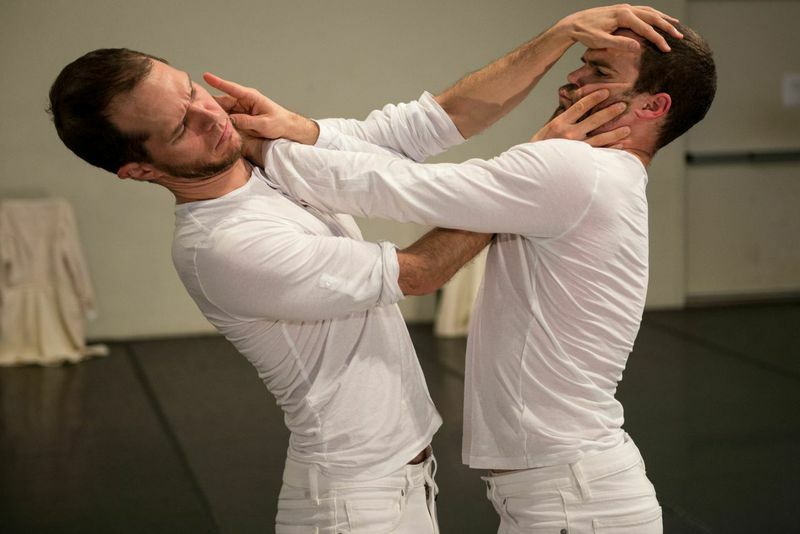 Graham’s smooth and mesmerizing way of moving take roots in his study of Gaga, while Grubb’s effortless physicality comes from his training in various techniques, including contact improvisation and capoiera . Most recently, Grubb appeared in choreographer Scott Wells’ the why we ask why we dance dance, demonstrating his astonishing ease with daring flips and acrobatic moves; last Spring, Graham instilled the end of choreographer Hope Mohr’s Notes Toward a Supreme Fiction with a wondrous vitality. In Michael & Roland though, their physicality was less outwardly, more internal. It is as if they were tuning into each other, finding a common language, thus pointing to how collaboration, not unlike friendship or love, is a process of moving toward the other. Michael & Roland will be featured in an evening of duets presented by James Graham at ODC Theater in December 2015. Next week, belly dance artist Jill Parker and flamenco choreographer Danica Sena are performing at Dance and Diaspora at ODC Theater. Beyond sharing the stage, both American artists share a passion for a dance form which roots are embedded in a culture foreign to theirs. Talking with Sena last week and Parker this week reminded me how we often find kinship, essential parts of ourselves and a sense of home in a community whose background is different from ours. How much of its cultural elements do we appropriate? And in doing so, how do we transform them? Parker talks further about finding sisterhood among the belly dance community and incorporating her own socio-political and artistic influences into this dance form which originated in the Middle East. Marie Tollon: What was the inspiration for the name of your company, Jill Parker and The Foxglove Sweethearts? Jill Parker: It’s not anything specific to belly dance. I wanted to have a name for the company that can capture the imagination, with some colorful visuals and a kind of sentimental and nostalgic quality. There are a lot of dancers who are far more produced than I am but I am really interested in maintaining a rapport with audiences that is very heartfelt. That’s where the ‘sweetheart’ comes from. I was a florist for many years and I love flowers. Conceptually, I thought that foxglove is such an interesting word, with the fox on the one hand and the glove on the other. Foxgloves are also poisonous flowers: a beautiful, intriguing visual thing but there is a power behind it that you need to be careful of. MT: How did you come to belly dance? JP: When I moved to the Bay Area, I was quite young and extremely socially awkward. I had a difficult time finding a job and making friends because of that. I worked in a café and met a couple of girls working in retail in the same stretch in Noe Valley. They had just started attending a newly created belly dance class at a community church nearby and they convinced me to go with them. I found an amazing sisterhood: women of different ages, very unique and very beautiful in this fiercely, independent sort of way that resonated for me. It both tamed me and helped me come out of my shell because I felt I found a family. The teacher was Carolena Nericcio who founded the dance style ATS -American Tribal Style®- and the dance company FatChanceBellyDance. It was a huge movement in dance in the late 80s, throughout the nineties and it continues to thrive today. 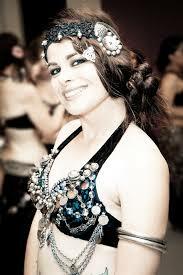 It has made a big mark on belly dance in the Bay Area and beyond. I was lucky to be on the ground level of this pivotal company. When I found that [community], belly dance quickly became the priority. MT: So you trained with the desire to become a performer? JP: FatChanceBellyDance has since become a very professionally run organization but at the time, things were just beginning to be established. Very early on, even if I wasn’t dancing, I was invited to play finger cymbals, to hand drums, etc. I didn’t have a lot of these skills but they were training me and bringing me up. Very soon, I was performing, for better or for worse! MT: You are the founder of the modern Tribal Fusion belly dance movement. What styles does it incorporate? JP: The ATS® swept the nation first, and then the world. It’s followed worldwide. When I made a departure from the company, it was not my intention to create an offshoot branch or a methodology. ATS® is extremely stylized and referencing folk forms from a time that they were not that accessible. It was incredibly difficult to get your hands on a VHS recording of something in Morocco or Egypt. We would have seen and watched a million times the very few that were out there. Often you would find images in old books or National Geographic magazines and create a dance out of static images. ATS® was the semi-fictionalized ethnic dance form that was stylized and codified to be an improvisational format with a lead and follow, and never choreography. When I moved away from ATS®, I thought about all my other influences, such as queer culture, arts culture, underground sub culture, and my deep love of things vintage, particularly the jazz and Victorian eras and art deco. So I started blending in much more these types of silhouettes, in the costuming and to some degree in the music. In my earlier experimentations, I was using everything from opera to experimental music, and performing with live experimental bands. After a lot of incubation, and really inspiring collaborations, I settled on some styles and techniques that were specific to me. As things became much more widely available through the Internet, I also became interested at classical Egyptian, specific folkloric styles and learning the actual dances. Some elements of these are also coming in too. Where ATS® is at the very strong and fierce feminist end of the spectrum, I was softening into a softer image of a woman still feminist but comfortable with embodying [her] femininity and sensuality. It doesn’t feel disempowering. MT: Can you tell me a bit more about the work you are presenting at Dance and Diaspora? JP: I’m doing some pieces that give a nod to classic belly dance with my own take and stylizations. I change the silhouette, the hands or the arms to reflect my love of vintage, the 20s, 40s and Victorian time. That’s closely linked into the traditional movement and the music. Then there’s the experimental part of the show where we are doing a woman zar trance ritual, with some modern liberties and theatricality. I’m also really excited about our group because there is diversity among us: one performer is Asian, one is Latina, there is a man… I really love showing audiences diversity as well as different body types than what the media always portray as the standard of beauty. I love it when I have bigger women, older women, taller women or a man. I am attached to having people question what they think. MT: In 1999, Scholar Andrea Deagon wrote about the misperceptions that belly dancers still face: “The view of the general public has not kept pace with the feminist bent of dancers’ images of their art. Belly dance continues to be marginalized as an art form; a professional dancer may have a difficult time being taken seriously.” Would you say it is still true? JP: Yes. It varies a lot from place to place because of people’s perceptions of the other and what is understood as foreign is different according to where they live. If you are from the South or the Midwest, you don’t have a lot of exposure to other cultures nearby and things may feel more threatening, particularly with the current political climate. I feel like a cultural ambassador. Giving insight of some beauty from [the Middle East] feels important to me. People with less exposure are thinking “exotic dance,” just as at the turn of the century when belly dance and other cultural dances were brought in the Victorian dances in world cultural fairs. People don’t know where these associations come from but they stick. MT: In your journeys to Morocco or Turkey, what did you feel that you learn that you couldn’t learn here? JP: Understanding that I may never understand how complex the relationship to the dance form and women’s role in the culture really is. No respectable Egyptian man would want his mother, sister, daughter, cousin, or wife to be a belly dancer, so it’s really complicated. In her own words, flamenco performer, master teacher and choreographer Danica Sena “stumbled upon” the Spanish traditional art form without having ever sought it. The daughter of Serbian parents, she was born in the United States, thousands of miles away from the land of flamenco. Yet, dance, music and creativity were always part of her life and culture, as long as she can remember. “I was never bored as a child. I would gather everybody on the block and say: ‘Today, we are going to do Cinderella’ and my dad would type up the script from the story. We would hand it out and sell lemonade!” While in junior year in college and already fluent in Spanish, she received a scholarship to study at Complutense, the arts university in Madrid, for a year. Marking the beginning of her deep passion for Spanish culture, this experience laid the groundwork for her discovery and study of flamenco. Sena and I sat down to talk about her background, the culture of flamenco and the work that she will present at Dance and Diaspora at ODC Theater later this month. Marie Tollon: What led to your discovery of flamenco? Danica Sena: My freshman year in college, I took an African Haitian dance class. My teacher recognized a talent in me and encouraged me to pursue dance. Without having tons of technique at that time, I would go to audition and people would hire me. One day during my junior year in Madrid, I went to the gym in my neighborhood. I looked in a small room through a circular window and saw this short woman teaching some kind of dance. Those were Sevillanas, the folkloric dance from Seville. [The teacher] could see I could learn the steps very fast so she put me aside, in a corner, and taught me advanced steps separately from the group. Within two weeks, she took me to the feria at Plaza de Toros. That was my first experience dancing outside with a male partner. When I came back to the United States for my senior year, I read on a bulletin board: “Flamenco guitarist gives lessons.” I went to his class and he showed me a video of Carmen Amaya. It was as if somebody threw a firecracker inside me and it exploded. I asked him “Where can I do that?” He said I could either go to San Francisco or to New York. I came to San Francisco and studied with Rosa Montoya. She took me under her wing. Shortly after, I was in her company and she had me teaching and helping run her school. I went to Spain and lived there for 10 years, in Madrid and Cadiz. MT: You will present three pieces at Dance and Diaspora, with guest artists musicians El Niño Manuel, El Gori and dancer Jose Carlos from Spain. Can you talk about meeting and collaborating with them? DS: While living in Spain, I was hired to go on a contract to Japan. That’s where I met El Niño Manuel. We worked together everyday for two years. Manolo’s wife, Maria Jesús, danced with me. We basically became family. This past May I took a group of students to Spain and set up an experience including José Carlos and Gori. [These artists] work together all the time and that in itself creates a very special energy. Three quarters of one of the pieces [to be presented at Dance and Diaspora] were created by Maria Jesus last June and then I continued the choreography with my advanced students. The rest of the pieces were created together. What I want to showcase is mainly the artists. MT: In an earlier conversation, you mentioned vocabulary and historical context that you would like to share with your audience. DS: I want the audience to understand that each one of us, somewhere in our cultural history, is connected to flamenco. The gypsies [from India] were a key component [in creating flamenco]. But when they arrived in Spain other cultures had already influenced the music: Gregorian chants, the Catholic Church, the Celts, the Phoenicians, the Sephardic Jews, the Persians, the Arabs, the Chinese! The mantón de manila -[embroidered shawl worn by flamenco dancers]- had dragons originally and came from China! The fan is Asian in origin. Flamenco is a global phenomenon! 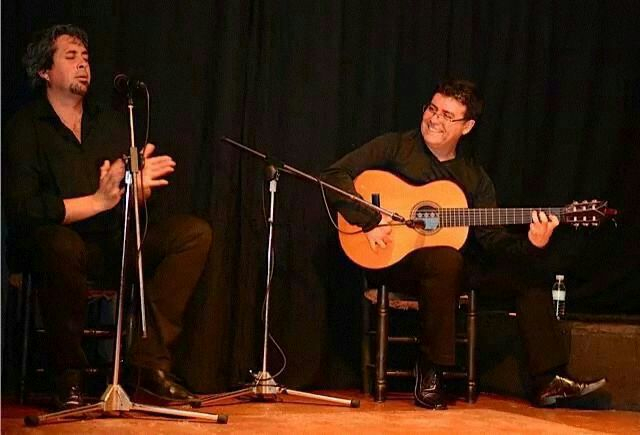 MT: In the way that flamenco was born, it was very much participatory, in terms of audience’s vocal presence and encouragement to the musicians and dancers. What do you feel happened to that element when flamenco was moved to the theater? DS: It’s always hard for me to make sweeping generalizations. You can’t orchestrate what the audience is feeling. I strive to nurture that connection. When the audience sits in closer proximity, it’s of course easier to connect. Even then nothing is guaranteed. First and foremost you should leave your ego aside. As an artist, you have to understand what your venue is. Why does flamenco often not translate onto large spaces? If you are on a huge stage you have to present a theatrical performance. Many flamenco dancers don’t have other training, and by training I don’t mean a couple of workshops/classes here and there or studying Youtube videos. Depth and length of training increase possibility and output. It all depends on what choreographies/styles are in your repertoire. What do you want to communicate to your audience? What is your vision? How can you collaborate [with artists from other fields or genres] if you are not well-versed? Respect the venue and respect your audience. Nobody wants to see a solo that is 20 minutes long! Do your legwork and understand your limitations. 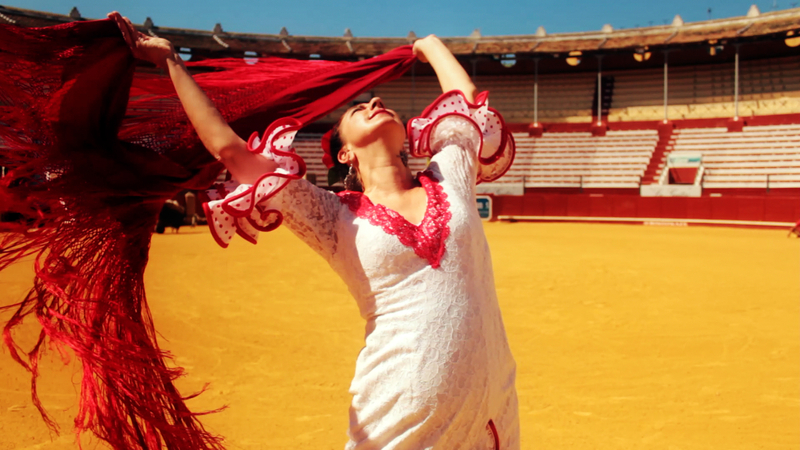 MT: Throughout its long history, flamenco has changed and evolved. There has been opposition between the purists, who want to preserve a certain vision of traditional flamenco, and the modernists, who have brought new elements to the art form. In an interview, you said that your dance is “contemporary and about your current situation.” You also said that for you “authenticity means delving deep into the tradition.” How do you navigate the balance between staying true to the form, yet allowing it to evolve? DS: The nature of art is intrinsically to be free. I am a forward mover. I’ve never gotten involved in that debate because I’m looking for connections and authenticity. Authenticity doesn’t mean being fixated upon a generation you weren’t a part of. The younger generations in Spain have opened themselves to other movements. Many have full training in other movement styles in addition to complete training in all of the Spanish dance forms: jota, escuela bolera, clásico español and danza estilizada. 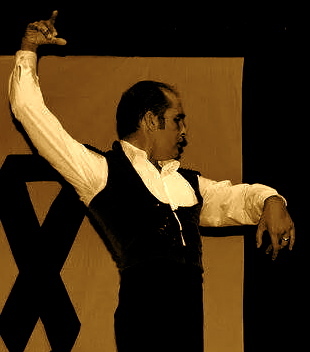 The only authenticity that one has to have in flamenco is to understand the musical form. I first make sure that I understand as deeply as possible the musical format and the form of the singing. What kind of movements would lend themselves to the music? What wouldn’t work? MT: In a recent article, Valerie Gladstone noted how “just as men like El Farruco, Antonio Canales and Antonio Gades did in past decades, it is the women who now dominate the field… and are “driving the art form.” Do you agree and if so, how do you explain this evolution? DS: The major companies that I know around the world are run by women. Flamenco is a very powerful expression for women because it is not a submissive or passive art form. Beyond its sheer physicality and energy it encourages the expression of emotions and it is a place where many women can showcase their strength. Next week, we’ll hear from world-renowned belly dancer Jill Parker, who is sharing the bill with Danica Sena at Dance and Diaspora.